The sensational Honda Civic is ready to impress small sedan drivers in Loray, VA. Find it right here at Harrisonburg Honda. Year after year, the Honda Civic continues to defy the standards of the compact car. 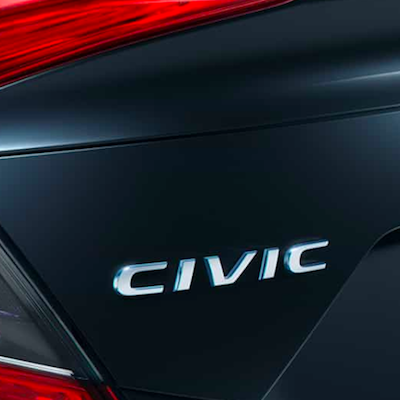 The Civic boasts modern styling, superior performance and safety features that rival all other vehicles on the road. If you live in the Luray, VA area and are ready to bring a new car into your life, visit Harrisonburg Honda to see the all-new Honda Civic for yourself. Your Honda Civic gets the job done in the coolest way possible with a sharp interior that’s modern and refreshing. Heat things up in the winter with available heated seats and if things get a bit too warm, open up available power moonroof and feel the breeze. Your interior will be lit up by a colorful display center that provides important information like the time, your speed and gas meter. You’ll enjoy every second you spend inside your Honda Civic. That begins the very second you settle in behind the wheel for your exciting test drive at Harrisonburg Honda. There’s nothing quite like being on the road in a well-performing vehicle, cruising along the highway without a care in the world. Well, the Honda Civic wants to bring that feeling back in a big way for anyone who sits behind the wheel. Enjoy up to 174 horsepower along with a fully independent suspension. You’ll also get your choice of two different transmissions, so you can personalize the Honda Civic to exactly what you want. Your Honda Civic will handle the road like a dream and you’ll be dreaming of hopping in the driver’s seat time and time again. 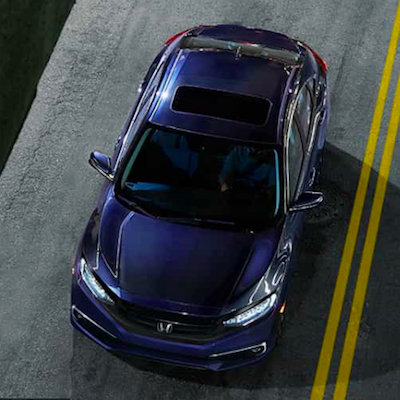 If the Civic is calling your name, contact the Harrisonburg Honda team today to set up your personalized appointment. The Honda Civic gives serious safety and you’ll be virtually worry-free when you’re inside the cabin of this car. Honda Sensing is the standard safety suite included in the Honda Civic and includes security features such as Collision Mitigation Braking System, Adaptive Cruise Control and Lane Keeping Assist System. The Honda Civic touts a plethora of driver-assistant tech that will alert you to any danger while traveling on the streets. Get your motor running and prepare for the all-new Honda Civic go be your new favorite ride. This one-of-a-kind sedan is going to pep up your daily travels and give you a fun drive to whatever lies ahead of your path. The team at Harrisonburg Honda can’t wait to show our Luray, VA friends everything the Honda Civic can do and we look forward to working with you in the future. If you’re looking for a fun challenge amidst beautiful, sculpted garden scenery, hop in your Honda and visit the Garden Maze at Luray Caverns. Take your family and friends along to help navigate your way through an intricate maze carved from eight-foot-tall hedges, and featuring fountains and tunnels. You can even get a birds-eye view of the maze from the lookout tower. 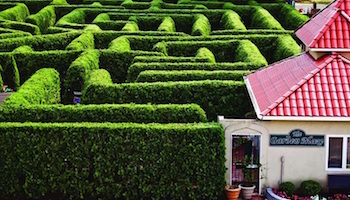 The Garden Maze is just another fun way to experience Luray in your favorite Harrisonburg Honda vehicle. If you love cars even half as much as we do, you’ll want to get together with family or friends and take your Harrisonburg Honda vehicle to the Car and Carriage Caravan Museum, located at Luray Caverns. 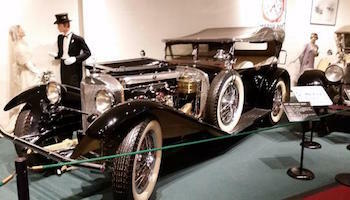 This unique museum offers a glimpse at one of the oldest and most rare automobile collections in the country. Get up close and discover each of the museum’s antique, vintage, and even historic cars, including a 1892 Mercedes Benz and a 1908 Baker Electric. This is not your ordinary zoo. 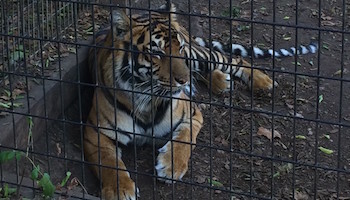 As the name states, Luray Zoo is a rescue zoo, featuring a diverse array of exotic animals that were once held as pets, but were found to be unwanted or even abused. These animals were rescued from potentially life-threatening conditions and given a second chance. Now, they are free to live out their lives with others like them, free from the tortures and suffering of their previous homes. This place is absolutely worth a visit in Loray, VA. The team at Harrisonburg Honda is the best around and we’re willing to prove it to you each time you step into our dealership! You may wonder what makes us so exceptional and we’d love to point out our differences from other Honda dealers around Luray, VA. A special aspect about our location is that Harrisonburg Honda has been in business since 1994 with the same owners at the helm the entire time. We certainly believe in treating our dealership team like family and that translates into treating our customers like family as well. We'll be the last place you need to visit. Why not save yourself a load of time and make us the first place you visit, as well? You won't need to go anywhere else to find the perfect Honda Civic and the perfect price, along with the perfect buying experience. When you work with the best, you get the best results possible.